Ok if Toad leading a Brotherhood isn't weird enough look at some of the members. After Freedom Force died out literally (Avalanche was the last man standing for Freedom Force) Blob and Pyro gave the Brotherhood another shot and Toad recruited a weird girl and a vampire dinosaur into his team. 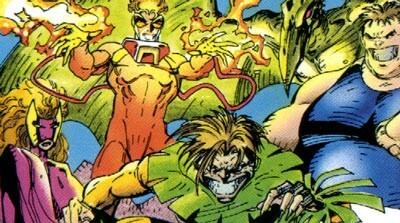 They fought and lost to X-Factor (whoever they are) over the course a couple of issues. This team went down when everyone found out Pyro had Legacy's Virus and the team fell apart when Toad went more psycho and left. While the team is viewed as a complete faliure I still rate it better than the second Brotherhood.